Ask for what you need. Give what you can. 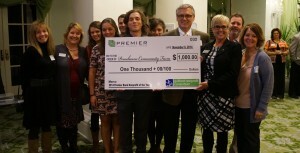 Peacehaven Community Farm was named the 2014 Premier Bank Nonprofit of the Year at the annual Celebration of Nonprofits held at the Greensboro Country Club on November 6. Executive Director Buck Cochran accepted the award on behalf of Peacehaven. Along with the recognition, Peacehaven received a check for $1000 from Lou Nunn, a representative of Premier Bank. The farm started in 2007 with the vision of connecting people with special needs to the broader community though the community of a working farm. In 2014, over 700 garden volunteers, including many with special needs, harvested 12,000 pounds of produce that were donated to food programs such as the Servant Center, Greensboro Urban Ministry, and Church World Services. Peacehaven achieved a long-standing goal in 2014 with the opening of Susan’s View, the farm’s first family-like home for adults with special needs. Ultimately, 30 adults with special needs will call Peacehaven home. Peacehaven also was selected as the North Carolina intermediary for the VISTA program. Fifteen VISTA volunteers are placed in nonprofits across region. Peacehaven Board Chair Gail Haworth says they are grateful to the Consortium to the Consortium for the valuable connections it provides local nonprofits to learn and collaborate with each other. She highlighted Peacehaven’s participation in the Executive Director’s Academy, ED and Board Chair Roundtable, the Non-profit Management Institute and the Board Development Academy as central to their success. © 2019 Guilford Nonprofit Consortium. All Rights Reserved.